Important Japanese Map of Singapore issued just after the WWII Battle of Singapore, considered by Churchill the 'worse disaster' in British Military History. 新嘉坡市街地圖 / Map of Singapore City. / Shingapōru shigai chizu. / 馬來半島旅行案内地圖 / Malay Peninsula Travel Map. / Marē Hontō ryokō annai chizu. A very rare 1942 WWII (World War II) map of Singapore City and the Malay Peninsula (Malaysia) issued by the Singapore Japanese Club. Although the first edition of this map was issued in 1938, the present example dates to 1942, and was issued just after the Battle of Singapore (Fall of Singapore). The Battle of Singapore was one of the most important Japanese victories in World War II and the considered by Winston Churchill, the 'worst disaster' in British Military History. 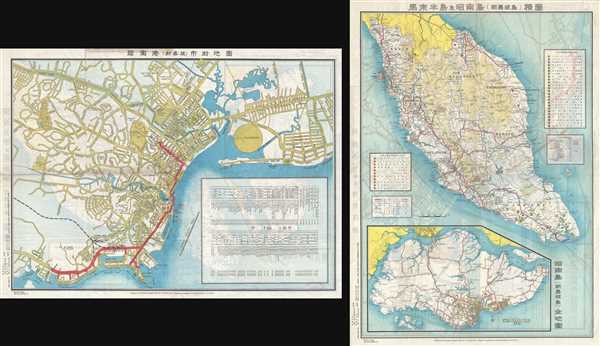 The map was doubtless resurrected to capitalize on Japanese interest and activity in Singapore following the capture. The campaign to conquer Singapore began with the Japanese 25th Army's invasion of Malaya (illustrated on verso) in 1942, and culminated in the February 1942 takeover of Singapore. This curious map is printed on both sides. The recto features a map of Singapore City, what is today generally referred to as the Downtown Core. It covers, roughly from Keppel Harbor to the Seaview Hotel and inland as far as modern day Newton. Streets and business are identified in both Japanese / Chinese and English. On the verso the map details the Malay Peninsula from Kedah to Johore and Singapore Island. Notes provinces, roads, rail lines, and major topographical features. At sea, shipping likes are noted. There is also a large inset of Singapore island bearing the date 1838. The cartography for both maps (front and back) is derived from the F.M.S. (Federated Malay States) Surveys. This map was originally published by the Singapore Japanese Club for its members in 1938, by the Dai Nippon Printing Company. This present map is the 1942 second edition printed by the Arai Company of Japan. The two editions are otherwise identical. We have identified only three examples in institutional collections, so this map is quite rare. Image above represents two sides of a single sheet. Very good. Light wear along original fold lines. Light soiling. Closed margin tears professionally repaired. OCLC 814208927. National Library of Australia, MAP G8040 1938 (1942 edition). Library of Congress, G8031.E635 1938.